Home » Aktuelles » Dr. Jochen Hellmann (DFH) : “The DFH has long been a Bologna laboratory and a European University avant la lettre”. Dr. Jochen Hellmann (DFH) : “The DFH has long been a Bologna laboratory and a European University avant la lettre”. 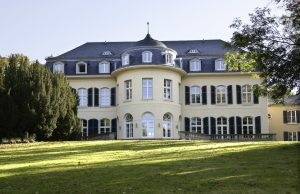 „There is no overstating the fact that the Franco-German University (Deutsch-Französische Hochschule – DFH) is uniquely positioned in the area of university internationalisation. The DFH is an institution that belongs to two countries, and where neither has the ‘last word’. It has created a structure for establishing transnational degree programmes which is unrivalled in the world”, so Dr. Jochen Hellmann, Generalsekretär der DFH, in seinem Artikel über die DFH, der vor kurzem in der Zeitschrift “Internationalisation of Higher Education – Developments in the European Higher Education Area and Worldwide“ erschienen ist. Den gesamten Artikel lesen The Franco-German University (nur in englischer Sprache verfügbar).